Before summer slips away for good, we and a group of our friends decided to throw together one last BBQ. We all chipped in and there was a wonderful assortment of snacks, food, and dessert. Chips and salsa, chips and cheesy dip, fruit with cream cheese dip, burgers and brats with all the fixings, jam crumble bars… Let’s just say I ate…a lot! My contribution to the effort was a large pasta salad. BBQ’s and pasta salad seem to go hand in hand, at least in my book. While I love creamy pasta salad with elbow macaroni and a mayonnaise base, I prefer a lighter dressing and zestier ingredients. 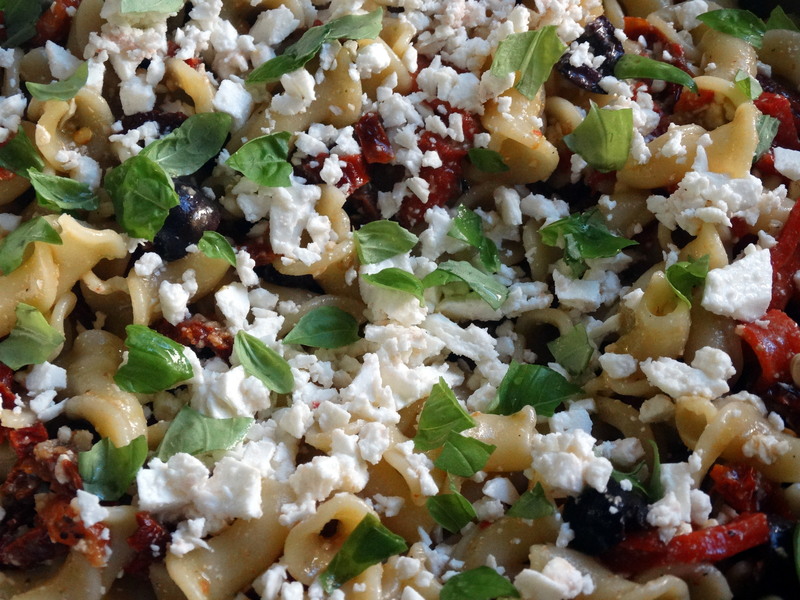 The past few years I’ve been perfecting my favorite: Mediterranean Pasta Salad. Are you ready to wow your taste buds?! Gather together the following ingredients: olive oil, red wine vinegar, fresh basil, scallions, parmesan cheese, coarse salt, ground pepper, pasta of your choice, dry sun-dried tomatoes, roasted red peppers, kalamata olives, garlic, red pepper flakes, dried oregano, feta cheese, and freshly squeezed lemon juice. 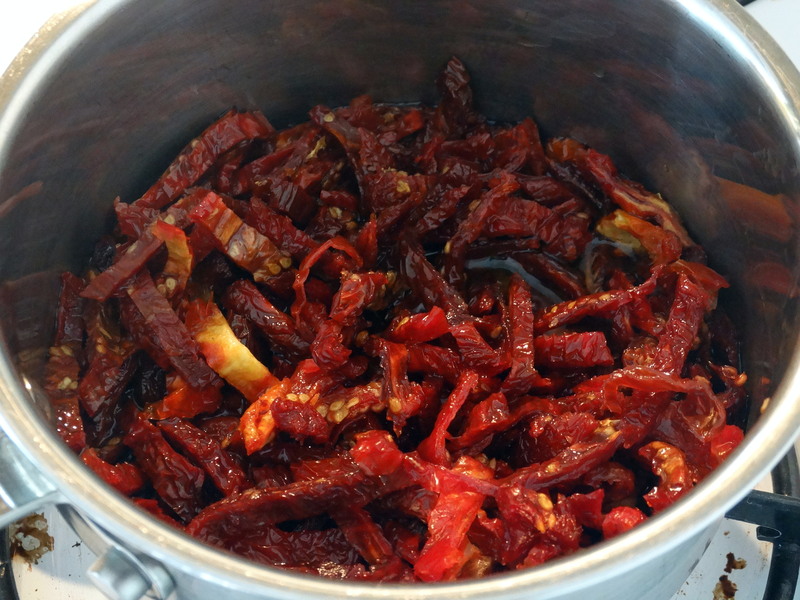 Slice 1 cup sun-dried tomatoes into julienne strips, then add to a small sauce pan with 1/2 cup olive oil. Heat gently over low for 15 minutes. This will help soften the tomato and will also add flavor to the oil. If the oil begins to boil, lower the heat. When done, drain the oil and set it aside. Bring a stock pot of water to a boil and add 12 ounces of pasta. I prefer using a pasta with curves and crevices, such as gemelli, farfalle, or rotini, to help capture the dressing and other ingredients, adding more flavor to every bite. This time I used beautiful campanelle. Cook until your pasta is al dente. While the pasta is cooking, make the dressing. Add 1/3 cup of the reserved olive oil, 3 tablespoons red wine vinegar, 1/4 cup fresh basil leaves, 2 tablespoons chopped scallions, 2 tablespoons grated parmesan cheese, 1/4 teaspoon dried oregano, and coarse salt and pepper to taste to a blender or small food processor. Mix until smooth. Slice 3-4 jarred, store-bought roasted red peppers (depending on their size) into thin strips, and then into inch long pieces. Place the tomatoes and roasted red pepper into a large bowl along with 1/2 cup sliced kalamata olives, 2-3 minced garlic cloves, and 1/2 teaspoon red pepper flakes. When your pasta is done, drain it and run under cold water to stop the cooking process. Add the pasta and dressing into your bowl along with 4 ounces crumbled feta cheese. Gently fold everything together until well mixed. Top your salad with an additional 2 ounces of crumbled feta, 2 tablespoons torn fresh basil leaves, and the juice of half a lemon. That’s all! Now you have a delicious pasta salad that will be sure to please everyone’s taste buds. Enjoy! 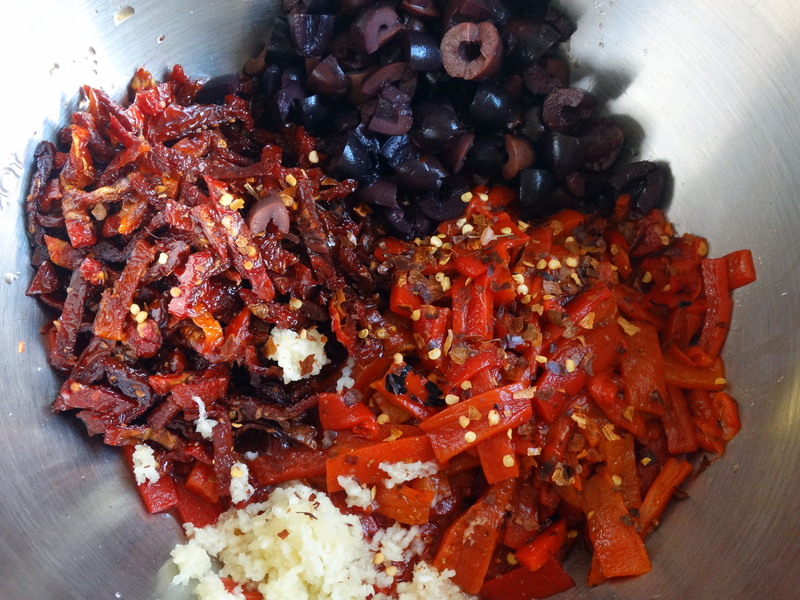 1) Slice 1 cup sun-dried tomatoes into julienne strips, then add to a small sauce pan with 1/2 cup olive oil. 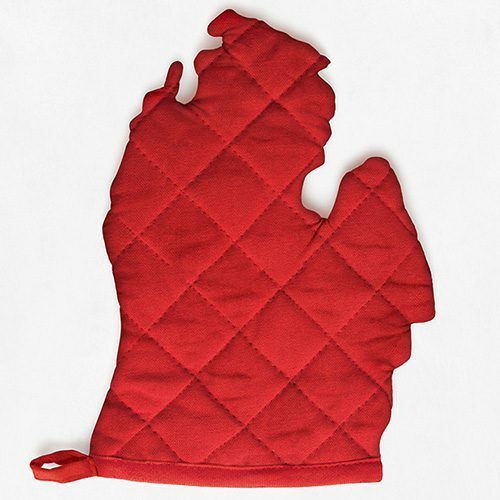 Heat gently over low for 15 minutes. This will help soften the tomato and will also add flavor to the oil. If the oil begins to boil, lower the heat. When done, drain the oil and set it aside. 2) Bring a stock pot of water to a boil and add 12 ounces of pasta. Cook until al dente. 3) While the pasta is cooking, make the dressing. Add 1/3 cup olive oil, 3 tablespoons red wine vinegar, 1/4 cup fresh basil leaves, 2 tablespoons chopped scallions, 2 tablespoons grated parmesan cheese, 1/4 teaspoon dried oregano, and coarse salt and pepper to taste to a blender or small food processor. Mix until smooth. 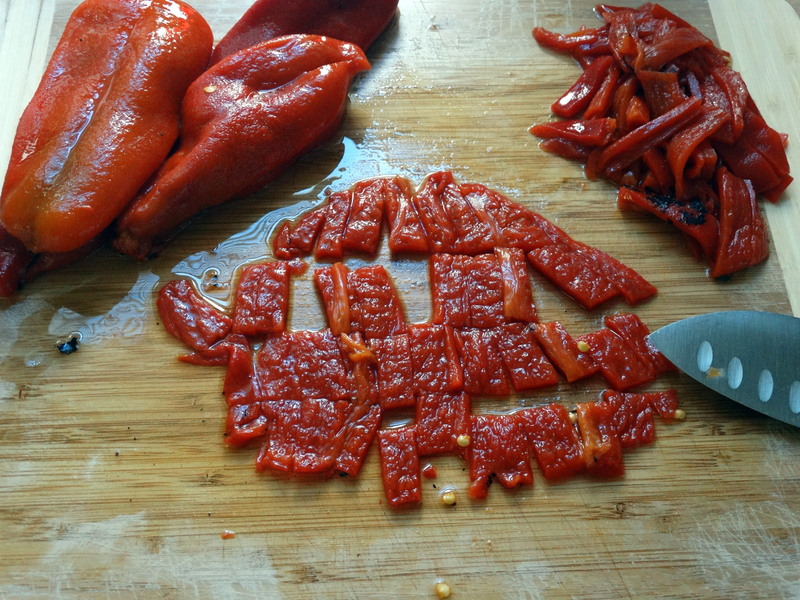 4) Slice 3-4 jarred, store-bought roasted red peppers (depending on their size) into thin strips, and then into inch long pieces. Place the tomatoes and roasted red pepper into a large bowl along with 1/2 cup sliced kalamata olives, 2-3 minced garlic cloves, and 1/2 teaspoon red pepper flakes. 5) When your pasta is done, drain it and run under cold water to stop the cooking process. Add the pasta and dressing into your bowl along with 4 ounces crumbled feta cheese. Gently fold everything together until well mixed. Top your salad with an additional 2 ounces of crumbled feta, 2 tablespoons torn fresh basil leaves, and the juice of half a lemon.